string(1245) "Resource Centre > Uncategorized > Taking Stock: Labor Exploitation, Illegal Fishing and Brand Responsibility in the Seafood Industry"
International Labor Rights Forum (ILRF) launched the Independent Monitoring at Sea (IM@Sea) project to address some of the vulnerabilities of migrant workers in the Thai fishing fleet by enabling worker connectivity while at sea, improving forced labor risk assessments, and developing a worker-driven grievance mechanism. The project set out to better inform government industry leaders, and civil society on actions needed: utilizing technology platforms to systematically collect, analyze and report on work at sea and connecting workers to worker organizations to implement such systems and remediate abuses identified. The project was a first step toward enabling fishing crews to use their voice to prevent and remediate forced labor and human trafficking on fishing vessels. 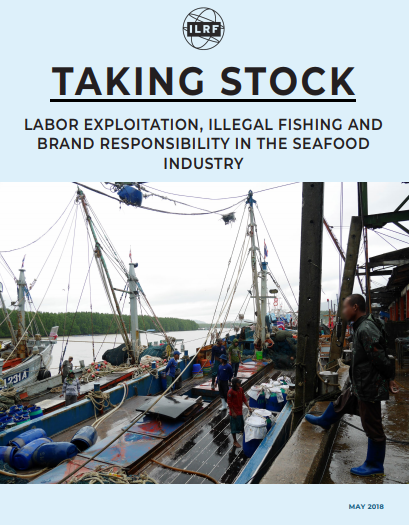 This report lays out four “Essential Elements of Effective Social Responsibility in the Seafood Sector” to build an effective human rights compliance program. It also explains how ILRF attempted to incorporate the Elements in the design and implementation of the project. Findings and lessons learned are shared to help improve future iterations of this project or efforts with similar goals. 1. Genuine worker representation: requires workers’ and their representative organizations’ involvement in all aspects of social responsibility initiatives and real-time, worker-driven monitoring at sea for fishers. Project design and implementation: The IM@Sea project attempted to include MWRN — a membership-based, migrant worker-led organization based in Thailand — at every step of the design and implementation process. MWRN helped develop surveys, collected worker data and negotiated with vessel owners for remediation of identified risk factors. Lessons learned: The IM@Sea project established the technological foundation for effective real-time worker-driven monitoring at sea, and proved such an approach to due diligence is not only feasible, but also desirable. Similar projects should prioritize in-depth, pre-project engagement between workers and their representatives; a reasonable internet and social media usage policy developed by vessel owners in consultation with worker representatives; and migrant fisher unions capable of scaling the Essential Elements model. 2. Comprehensive and transparent risk assessment and verification of workplace compliance: requires comprehensive and in-depth worker interviews on land, close scrutiny of employment-related documents and data on working conditions at sea, and transparent tracking of human rights performance in the public domain. Project design and implementation: The IM@Sea risk assessment system was designed to draw on information gathered from Burmese migrant workers, employment-related documents obtained from Thai fishing vessel owners, and video data of vessel operations. Information was collected from workers through an in-depth, in-person survey implemented onshore, and a mobile phone survey implemented at sea. The risk assessment was score-based and assigned points to individual workers based on the data collected. The preliminary findings of the risk assessments suggested some workers were at high risk of forced labor, but ILRF could not draw any definitive conclusions due to issues with some survey questions and a lack of clarity on certain conditions. The team did, however, use the findings to engage vessel owners in a discussion about the needs and expectations of the participating workers. Lessons learned: Onshore assessments and worker control of data flows are critical to the success of human rights compliance programs in the fisheries sector. While at-sea data collection is important, onshore assessments build connections between workers and their representative organizations and provide more accurate information on certain conditions. 3. Legally-binding and enforceable agreements: are a pre-requisite for access to effective remedy, which in turn is necessary for brand accountability. Project design and implementation: The IM@Sea project MOU (contract) set terms between employers (vessel owners) and a representative worker organization (MWRN) acting on behalf of a defined set of workers (participating crew), as well as a means for suspected violations to be recorded and addressed. While not a fully functional complaints system, the IM@Sea grievance mechanism – designed to fulfill the eight effectiveness criteria of the UN Guiding Principles on Business and Human Rights – did require vessel owners to negotiate with MWRN about how to address the suspected violations, which both participating owners in the project did. Lessons learned: Designing an effective operational-level grievance mechanism requires negotiation between workers and employers as equals. An independent third-party knowledgeable about the sector and the national context should administer the mechanism to ensure outcomes restore workers and help rehabilitate employers and managers. Adequate resources for enforcement must be secured for effective implementation. 4. Changes to brand purchasing practices: are necessary to incentivize and enable suppliers to comply with human rights norms and brand requirements. Project design and lessons learned: While changing brand practices was not a focus of the project, the findings of vessel owner meetings underscored the need for an industry-wide approach to many of the issues common in the Thai sector that were identified by the IM@Sea risk assessment. Such an approach must include brands and retailers, given their influence over the ability of suppliers to provide decent conditions. Based on the IM@Sea project and additional research, ILRF calls for a new social and environmental pact between businesses, trade unions, and civil society organizations where workers are empowered by their representative organizations to secure both decent work and sustainable fisheries. While the details of such an agreement must be negotiated between the relevant stakeholders, there are important precedents from which lessons can be drawn. Such precedents include industry transformation initiatives such as the Bangladesh Accord on Fire and Building Safety and the Coalition of Immokalee Workers’ Fair Food Program. These initiatives have made significant strides in transforming industries long known for egregious worker abuses. It is time for the seafood industry and concerned civil society groups to pursue similarly transformative initiatives.